If you are looking for a book to give a beginner, or to encourage a teenager to do something more energetic than lie slumped on the sofa texting his friends, the Sotheby’s Guide is definitely worth a punt. In just under 300 colourful pages, this coffee-table book attempts to cover everything there is to know about fly fishing for trout and pretty much gets away with it, although I would love to know exactly how much time had elapsed since the rainbow on the front cover have been let out of the fish farm. You would think that a firm with Sotheby's reputation would have asked for a better example! Subjects range from the usual stuff on trout senses, through food items, tackle, angling clothing, flies, casting, tactics and fly tying. 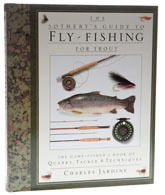 As a taster of what is available, the Guide is hard to beat, although the heavy emphasis on illustration might make the sport look a little daunting to an untutored beginner – for example, there are no less than 77 pages of fly patterns, including a handful from The Treatyse of Fishing with an Angle (which date to around 1496 and are not much fished these days, for some reason). The photography is excellent, the design appealing and the text is hard to fault, but the extremely broad remit means that the Guide flits from one topic to the next with such despatch that it can’t really be regarded as anything except a primer.